The CDH-720 and TDS-720 Series water-resistant conductivity/TDS meters are OMEGA’s reply to requests of accurate, low maintenance process monitoring equipment at affordable costs. Four different models are available to cover all applications. Each meter is supplied with a direct 2 pin probe and 2 meter (6.6') cable with a 1 /2 " thread for flow-thru mounting. The probe has a temperature sensor that will automatically compensate against temperature changes from 5 to 50°C (41 to 122°F) with a ß of 2% per degree. 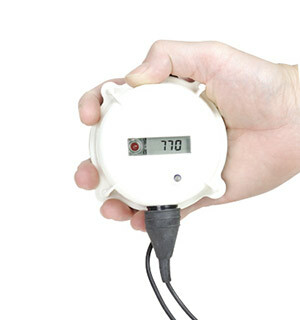 In the measurement mode, a red LED will warn the user in the event the reading is outside of the alarm interval. A front trimmer allows manual calibration at 1 point. The electrical circuitry is tightly sealed inside the water-resistant enclosure. In addition, thanks to the molded hook, the CDH-720 and TDS-720 Series be easily and quickly installed anywhere. The specially designed casing is stable and will not roll off a table. The 12 VDC power supply makes it ideal for continuous monitoring over extended periods of time. Please download specifications for complete list of available models.